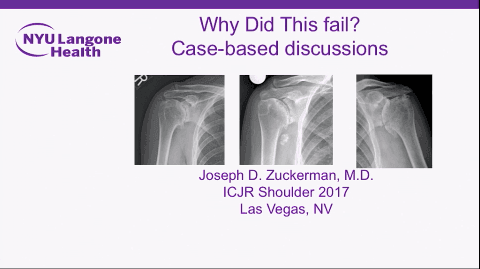 At ICJR 6th Annual Shoulder Course, Joseph D. Zuckerman, MD, from NYU Langone Health, challenged a panel of surgeons experienced in primary and revision total shoulder arthroplasty (TSA) to review the radiographs and physical findings of 7 cases of failed TSA and comment on how they would manage those patients. Below are the cases presented by Dr. Zuckerman. Click the image above to watch the presentation and view the radiographs presented by Dr. Zuckerman.